We’ve found a fabulous range of children’s shoes. But more than that – we’ve found an amazing and inspiring story. Toms Shoes is the story of an amazing company with a social conscience and a spirit of adventure. Every year they conduct a giving trip, taking staff and several lucky customers along with them as they travel to somewhere in the world where they can be involved with local Shoe Giving Partners to give away shoes to children in need. Their Shoe Giving Partners are humanitarian organisations with local knowledge of the needs specific to the areas in which they work. Toms partner with them through their One for One program, which guarantees that for every pair of Toms shoes they sell (adult or child sized), they will donate another pair to a child in need somewhere in the world. You can see more about that interesting and inspiring program in the video below. Feel-good factor aside, Toms has a phenomenal range of footwear. Tiny Toms is their collection for children aged up to five years, and the range is colourful and varied. Most Tiny Toms are canvas slip on shoes, but there are also a large number of Mary Jane styles as well as velcro closures. There are bright geometric and floral patterns, and even glittery sequined Tiny Toms that will please any four-year-old girl. All are easy for small hands to manage and have suede insoles for added comfort – except vegan styles, which of course have canvas insoles instead. They really do have something for everyone! 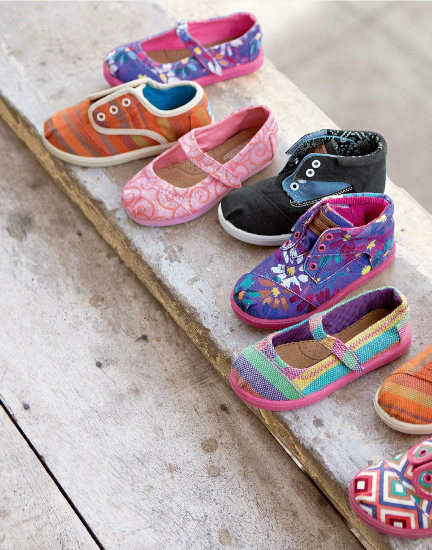 Check out the whole range and buy online directly from Tiny Toms, where prices for canvas shoes begin at US$29.